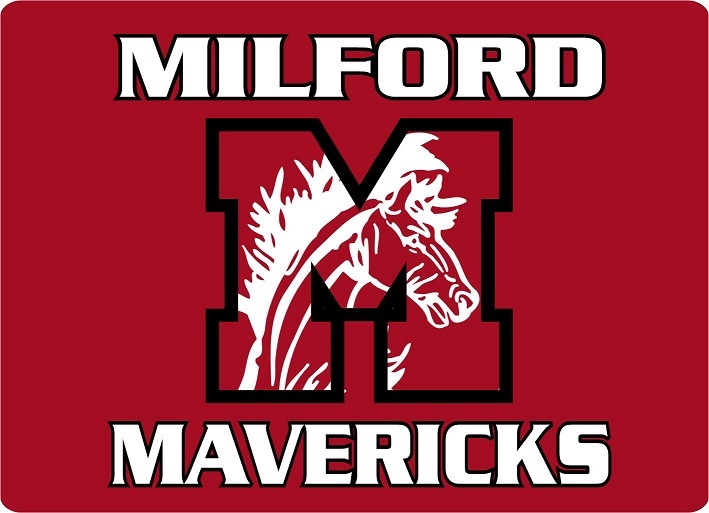 MILFORD MAVERICKS SPIRITWEAR AND ACCESSORIES! MILFORD MAVERICKS apparel and accessories are now available to order online! Please note: We will be adding items to this store on a regular basis. Please check back soon to see new items available! ORDER DEADLINES ARE THE 1ST AND 15TH OR EACH MONTH. All orders will be held until the above order deadline windows, then processed in bulk. Delivery will be approximately 2-3 weeks after the order deadline. Please note: Delivery date is not guaranteed, but our best estimate based on normal order processing without product back orders or unforeseen delays. We will so our very best to meet this delivery estimate. You may customize most items with player name, or name and number at an additional cost. All items available for customization will have a drop down menu on the description page of that item. IMPORTANT - be sure to indicate correct spelling of player name or name & number in the COMMENTS section during the checkout process. 1. "IN-STORE PICK-UP". When complete, you will be called for order pick up in our store in FOWLERVILLE. There is no extra cost for this item. 2. "US MAIL". When complete, your order will be mailed direct to the address on your order form. There is an additional charge for this option. (cheapest of the home delivery options). 3. "UPS GROUND". When complete, your order will be shipped via UPS GROUND service. There is an additional charge for this options. (most expensive of the home delivery options).